I mounted the right flap fairing this afternoon. In order to mount this fairing, you have to ensure that the flap is at the neutral up position. The way to do this is mount the aileron, affix it in the neutral position and then match the flap to the aileron. But, how do you make sure that the aileron is in the neutral position? 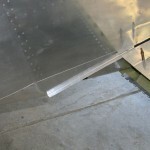 Some builders use a straight edge aligned with the tooling holes in the end rib of the wing. I chose to use the wood wing profile cutout that I saved from the wing kit. 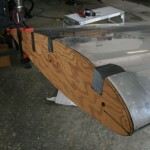 Once I had it mounted on the end of the wing, it was a simple matter to align the aileron with it. From that point, it was a matter of just mounting the flap fairing so that it was flush with the top of the flap. Took longer than it should have, of course, but patience was rewarded and the job was completed. This entry was posted in Wings on August 25, 2013 by Mark Dickens.